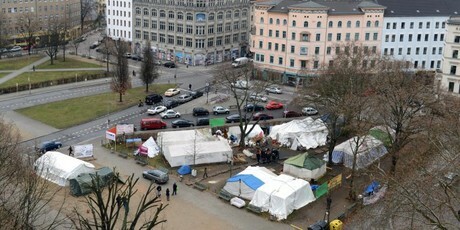 Last December, whilst in Berlin for a reading at the Kreuzberg Museum, I visited the Infopoint of the refugee camp in Oranienplatz, installed there since October. At the time, there were around 80 refugees living in the tents, including people from Syria, Palestine, and sub-Saharans who used to work in Libya, before managing to flee and avoid being forced to join either of the armies in the previous year's civil war. Others, like C.C. from Togo, have been in Germany for over 8 years, still awaiting papers. It's cold in Oranienplatz, but the spirits were high. Whilst chatting to some of the activists at the Infopoint (in between power cuts, searching for medicines, and English-to-French interpretation for C.C. ), I was happy to learn that around 100 volunteers rotate shifts there, manning the Infopoint and keeping on the lookout 24 hours a day. Two of the volunteers I conversed with had come to Berlin for a few days from Vienna and Oxford; one of them was severely worried about a potential attack by neo-nazi groups, who assemble only a few U-bahn stops away. He had brought his large black dog along with him from Vienna, just in case. That evening, the dog was as peaceful as ever. The bravery, energy and active solidarity of these volunteers is almost overwhelming. In a speech at the Kreuzberg Museum the previous evening, the mayor of Kreuzberg-Friedrichshain did not beat around the bush - after speaking of the Oranienplatz refugee camp (only 200m away from the Museum), he expressed his personal shame for not having done more, and earlier, to help the refugees currently living there. With the mayor's consent, over the next couple of weeks, refugee families were slowly relocated to an abandoned school 15 minutes away from the camp. Tagged with Oranienplatz, Berlin, Kreuzberg, refugees. December 26, 2012 by Antoine Cassar.